I adore nature. Call me a tree-hugger, but I’m the girl saving spiders, running barefoot through the mud or picking up random leaves to inspect whether they have a particular aroma. I guarantee evolution would have killed me a century ago, if left to own devices. Nature is my place of rest and relaxation. And if there’s ever an opportunity to don my backpack and hit the trails, I’m there! Especially if my trail partners happen to be tree-huggers of equal intensity. Fortunately, Ryan’s parents just happen to fall into this unique category. Not long after our wee Opaz was born, we took a much needed trip to the Peneda Geres National Park (Parque Nacional Peneda-Gerês) located along the northern border of Portugal and Spain. Peneda Geres is a stunning labyrinth of regenerating oak forests, undulating green valleys, peat bogs, 300 million year old granite mountains and tranquil waters of the Homem River. 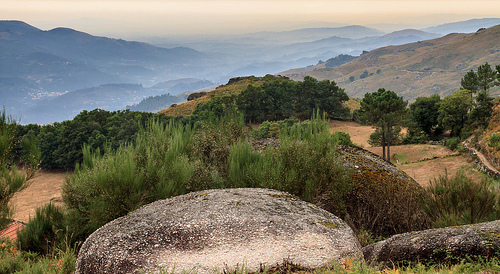 It also happens to be the only National Park in Portugal and touches one of our favorite wine regions, Vinho Verde. Vinho Verde is the northern most wine region in Portugal, famous for its crisp and refreshing whites that are typically made with Alvarinho and blended with Loureiro, Arinto, Trajadura, Avesso or Azal. Generally lemon straw in color, with fresh grassy notes, they tend to pair with just about anything due to their crisp and approachable style. Hence, we would suggest pair beautifully with local specialties such as caldo verde (green soup), a blend of paper-thin slices of kale grown throughout the region, stirred into a puréed base of potatoes, onions and garlic, garnished with smoked chouriço sausage. Or try the arroz de lampreia (lamprey and rice stew) made with chouriço and vinho verde, topped with parsley and served over rice. The creation of the National Park, back 40 years ago, envisioned mountainous spaces that were conserved, while permitting human and natural resource activities, which would include educational, touristic and scientific projects. All 269 square miles (697 square kilometers) of Geres is inhabited by humans, but is highly regulated to ensure that the ecosystem is constantly supervised, nurtured and carefully exploited to support conservancy. Portugal also has nature reserves, nature parks, protected landscapes and several natural monuments. Except for the national park designation, local or regional classifications can use whatever designation is relevant for them, as long as the name is accompanied by the “regional” or “local” qualifiers. To be honest, I had never heard of the park prior to our visit and was astonished to learn of its biodiversity. To date, you can still find packs of gray wolves prowling the thick forests – though limited, alongside wild boar (plentiful and delicious), fox, Roe Deer, Portuguese Ibex and otter, not to mention my favorite, the Iberian Red Squirrel. Looking skyward and you may spot one of the 147 Portuguese birds living within the park, including the Golden Eagle and hawks. And not that I’m a close friend of the bat, but the park protects 15 different bat species – 10 of which are endangered. tombs, interspersed with the occasional Roman road and Espigueiros – large stone grain stores, with thin slots in the sides for ventilation, propped on stone pillars. Rather majestic when seen against a vast and expansive landscape, they’re still used across northern Iberia. 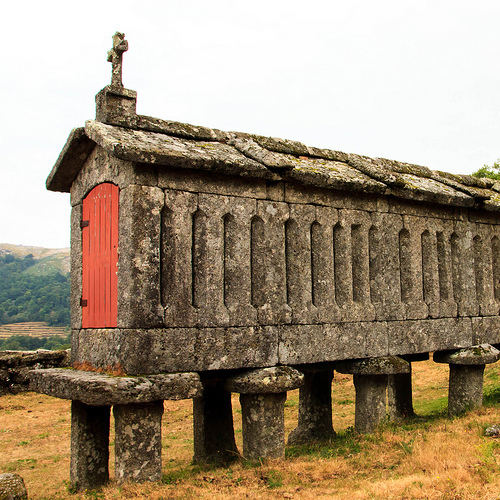 Head to Soajo and Lindoso to get an eyefull of these incredible structures. Though nothing in comparison to the vast offerings in the North American National Park system, you will find a handful of campsites throughout the park, in addition to several hiking trails – generally, well marked to find top tourist spots, such as Castro Laboreiro and Calcedónia and the monastery at Pitões das Júnias. If you’re going by car, be sure to head up to the waterfalls, near the old frontier station at Portela do Homem, and the village of Vilarinho das Furnas, assuming the Vilarinho das Furnas Dam is at its low point. Additionally, be sure to look for the dozens of thermal baths scattered across the park. These are fabulous little spots where you can quickly refresh with a jaw-dropping view. To find them, simply ask your hotel or b&b owner. From our understanding, everyone has their favorite “watering hole” to dive into. Though hard to believe for a government run entity, the park’s website is extremely comprehensive, listing: trails, accommodation, gastronomy, activities and contact info – to name a few. However, be sure to click on the language of choice in the top right-hand corner each time you go to a new page. If not, the default option of Portuguese may pop up. 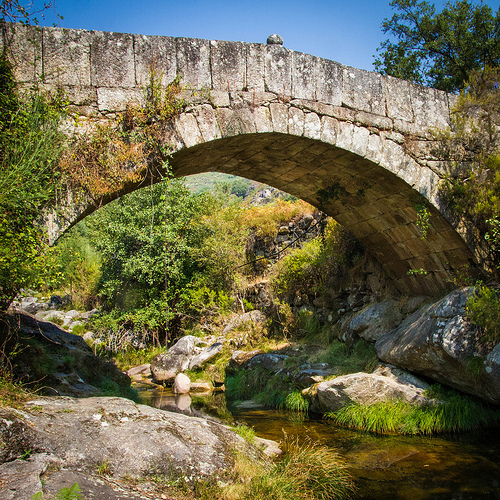 If you’ve been to the Parque Nacional Peneda-Gerês, let us know your thoughts!